French: 1.366" x 25.4 tpi Body Markings MAVIC on center of barrel. Early models have Mavic opposite flange as well as barrel. The 500 hub was originally introduced by Mavic in 1975 and featured a sealed bearing system. The 500 was soon replaced by the 500 RD which allowed the user remove the axle and adjust the bearings- similar to Phil Wood's FSA. The 550 RD version of the hub, considered the Pro or Team Model, was essentially the same overall design with two major exceptions. First, both the axle and shell were anodized to provide strength, second, the drive side bearing was moved farther outboard and closer to the freewheel*. Additionally, the 550 featured a quick release that used both alloy and steel parts, whereas the 500 used steel. The hub was produced up until the 90's with very little changes- mostly the placement of logos and decals. 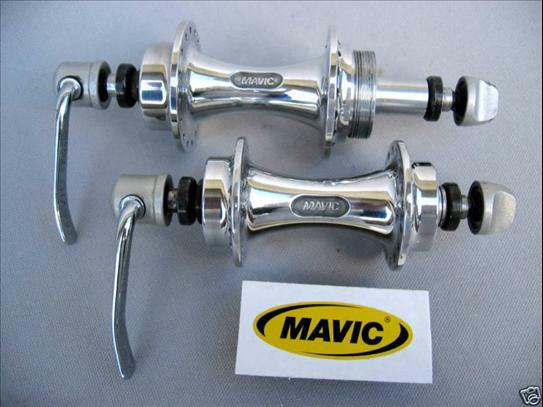 They were sold alongside Mavic's cassette hub models such as the 571/572 and 577. Similar models were also produced. The 510 was the same design as the 500 RD, but featured a 80mm spaced front axle and the 501- the same 500 series hub, but the rear was spaced at 130mm to accomodate 8sp freewheels. Note- the last photo in the set is a pair of hubs modified by an ebay seller and was not an official mavic offering. *This is one of the easier ways to differentiate the 500 from the 500RD- the bearing on the RD is exposed on the drive side while the 500 has a dust cap.